Philip Drachman was born in 1833 in Piotrkow, Trbunalski, Lodz, Poland. His siblings were Sam and Augusta (Mrs. Hyman Goldberg), both of whom played a role in his American adventure. Philip Drachman arrived in the United States in 1852, on same ship that carried members of the Goldwater family. All were evading Russian military service, and escaped Eastern Europe via England. Drachman found his way to San Bernardino, California to visit his sister Augusta, now Mrs. Hyman Goldberg. 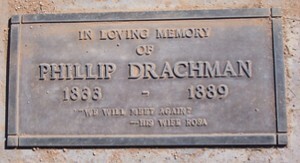 Philip Drachman then traveled with his cousin, Isaac Goldberg, to Tucson in 1857. 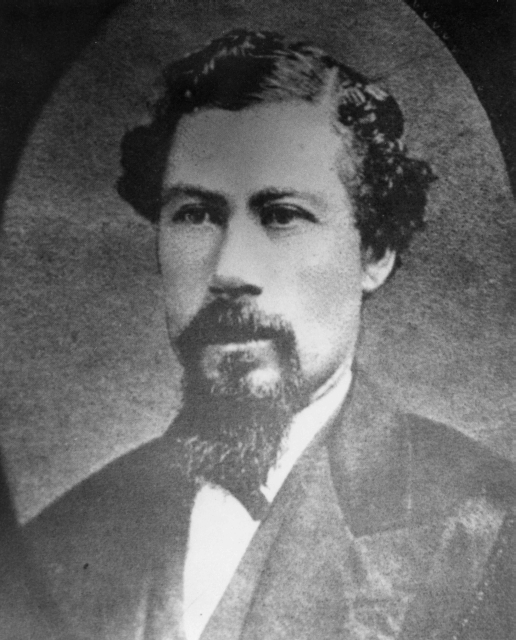 Drachman visited San Bernardino, California again in 1860 where he became an American Citizen. While in Tucson, he followed his friends, the Goldwaters, east to the Colorado River. 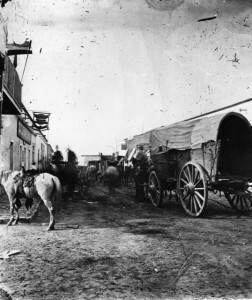 In 1863, Philip Drachman was a member of the Colorado River Farming and Stock Raising Association. The 1864 Territory Census shows P. Drachman having $1,000 in real estate and a personal estate of $4,000. Drachman was the hired by A&L Zeckendorf to manage their Tucson store, specifically to sell remaindered goods. He traveled the territory, by wagon a mule selling off excess inventory. He would deposit Zeckendorf’s money in a Los Angeles bank — traveling at night to keep the gold and silver away from dangerous eyes. In 1870 he had a store with Isaac Goldberg in Tucson called Goldberg & Drachman’s. Philip Drachman and Isaac Goldberg, purchased land along the Colorado river at La Paz. They merchandised to La Paz, Prescott and Tucson. They also did the freighting. Government contracts needed to be filled. This lasted until the Southern Pacific Railroad put a stop to “freighting,” convincing the government to use only the railroads. In 1881 Philip Drachman ran a saloon called the Post Office Exchange, in Tucson – probably backed by the Zeckendorfs. In 1886, Drachman opened his own cigar store in Tucson. Philip Drachman represented Pima County in the 3rd and 4th Arizona Territorial Legislatures in 1867, when it met in Prescott, Arizona. Drachman was a charter member of the Society of Pioneers, in 1884. Later, he was one of the founders of the B’nai B’rith Lodge in Tucson. Drachman was also a member of Arizona Lodge No. 1 of the Ancient Order of United Workmen. In 1868 Philip Drachman married Rosa Katzenstein in New York City. The match was initiated by Rosa’s cousin, Louis Zeckendorf. Children: Emanual, Albert, Esther, Harry, Rebecca, Lillian, Phyllis, Mose, Myra, and Minnie. The 1900 Census shows 16 children born, with 10 living at the time. 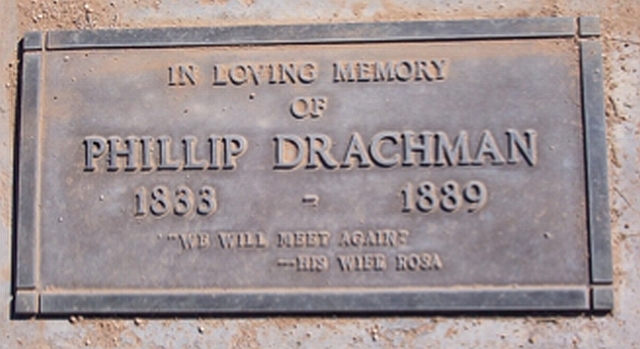 Philip Drachman passed away from pneumonia in 1889, in Tucson, Arizona Territory. Floyd S. Fierman, “Philip and Samuel H. Drachman and the Goldberg Brothers: Arizona Pioneer,” Western States Jewish History 31/2. Lyons Bettina O’neil, Zeckendorfs and Steinfelds, Merchant Princes of the American Southwest, Arizona Historical Society 2008, available at the Tucson Jewish Museum. Regina Merwin is curator of this Philip Drachman exhibit.